Building a workplace culture of wellness is one of the best things employers can do to boost employee health – and to improve the bottom line. When employers and workers join forces to battle high healthcare costs, everyone wins. Organizations across the U.S. are making incredible strides to achieve higher productivity, lower absenteeism and reduce claims. People who take a more active role in managing their own health enjoy the payoffs, too, in quality of life and cost savings. Research shows that health risks are directly related to costs. As the risks increase, so do the costs. Heart disease, obesity and other costly conditions can be prevented when people engage in healthy behaviors both short term and long term. For each employee who loses low-risk status, health costs go up $350/year. If they regain their low-risk status, they save $150/year. High BMI individuals cost an average of $2326 (1996 dollars) more in annual health claims compared to healthy BMI individuals. High-risk health plan members cost approximately $2000 over the average for annual medical claims. High-risk employees (5+ risk factors) between ages 35-65 have medical claim costs of $3007-$4182 higher/year compared to low-risk employees in the same age group. The most effective way to increase the proportion of employees in the low-risk category is to keep them from developing risk factors. Encouraging physical activity and balanced nutrition, along with other healthy behaviors, is central to any health promotion program. Employees spend a significant portion of their waking hours on the job. Employers can significantly influence lifestyles by developing worksite programs to maintain healthy behaviors. Environment – Healthy food, smoke-free facility, physical activity and injury prevention policies. 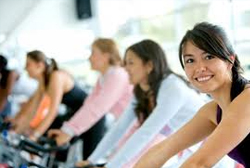 Programs – Health promotions, recreation programs, employee assistance programs and coaching. Culture – Incentive systems, role models, education. Policies – Medical coverage for preventive care, flextime, guidelines to monitor and reduce stress.